• Fast and sensitive. Linear detection range (20 μL sample): 0.05 to 60 U/L for a 30 minute reaction. 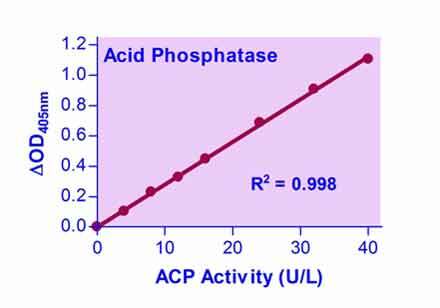 BioAssay Systems non-radioactive, colorimetric ACP assay is based on the cleavage of p-nitrophenol from the synthetic substrate. p-Nitrophenol becomes intensely colored after addition of the stop reagent. The increase in absorbance at 405 nm after addition of the stop reagent is directly proportional to the enzyme activity.